I’m cheating a bit as Ray is doing a blog so I will use that as a guest blog for tonight as I’m so tired and emotionally drained really. So many lovely messages on Facebook, emails, messages and tweets and messages. I have been so overwhelmed at the love and encouragement. Wow! An emotional day all round. It was Marsden Day. We ran to the car park in pouring Rain. It didn’t matter much to me I was soaked anyway having walked louis up the lane. It was 10 to 6 we decided to leave early because of the bad weather. The journey was a stop start one on the M25. Oh dear when Mavis booked in they said Your not due until tomorrow. But go and wait in waiting room and we will sort it. Which they did. But it was a disappointment for them because they had planned a party for Mavis on Wednesday. They had ordered a cake and buns. We didn’t know and it was not our error. We did the usual bloods and a final with the doctor. Then we set off to the restaurant for a cuppa. Gently sipping my Tea when I had red flashes in my eye that made me jump then instantly the bleeper went off and I almost spilt my tea all down me. So we had to dash back up stairs to see whats up. It was only one of the bloods had gelled and a fresh one was needed. WE chatted to Amanda in reception. After the Doctors chat he re assured us that all was well with our last scan and that now for us the Trial had finally come to an end, not to worry because we will be scanned regularly and any new growth and we can have a further years drug again. he wished us well. WE went down for some lunch during maves and my chatting I lost it. WE had talked to a mesowarrior who wasnt doing so well. I simply said to mave we are just plain bloody lucky that you’ve got this far. Wow! I could feel my eyes smarting I tried looking down to avoid her eyes and she asked me are you alright. Yes cos I am I spluttered. I was so emotional. WE made our way back to the waiting room again that was around 1pm. The drug didn’t arrive until 3.15. Eventually we were all done and then it was hugs and kisses all round nurses and us all saying we will miss each other. We said carry on and have the party tomorrow and we will be with you all in spirit. It was time to leave with mixed feelings .Glad we didnt have the early riser and M25 journey every fortnight. But sad because we wont be seeing the galls so often. But they have done there job we have cut the cord and are now free to roam. We will pop in on scan appointments promise. The journey home was ok and we had to pick up a bit of shopping before greeting Louis again. He was pleased to see us. A quick walk with louis was in order. Now for a while we can try and live a normal life. What a journey I will write a look back to sum up what it all means to me that at this moment do not have a live Mesothelioma. It’s all laying dead in my lung. I hope that is where it stays. My young Doctor today put a little doubt in our minds when he said the cancer is very clever and it could find away round the Immune System. He wasn’t saying it would! but it could! Oh well I will put that in a box and shut it away in a corner of my brain !!! I realise I haven’t written an update, but can you believe I have felts so depressed. I know this time of year as I come up to the anniversary of our darling daughters death, in 1979 I do know I can tell the date by how I feel, but I have been really feeling of down in the dumps. I have had survivors guilt as I really want more mesowarriors to have the opportunity of drugs. At least to try to see if they could work. We now have a few going private on this and I know how hard financially that is. I have pushed for the cost of these new drugs to be included in the claims for compensation and that is happening for newly diagnosis, or at least its being talked about. The winter has seemed so long as the weather has just started to warm up. I have kept busy and Iv cleaned the Motor Home, after we have neglected it a bit only used it once or twice. But that is going to change as next Tuesday is my last drug day. The fear that cancer will come back again is huge for me. My cancer has come back 4 times when being treated with Chemo so I must have a belief that what people say about Immunotherapy is true and yet that have no proof yet. I’m showing them the way so that puts a lot of strain on me. I have to believe Im now cancer-free and determined to enjoy life to the full. But still, when I feel unwell the fear sets in and despite so many friends and family I can feel very alone. I sit and think too much. This is how I have felt. Writing it down it reads like I’m feeling sorry for myself isn’t that selfish. So actually I’m going through a normal Process so that cheers me up and I’m coming back again. I try to do a job a day like yesterday cleaned the fridge out and today I washed the airing cupboard and a kitchen cupboard out. 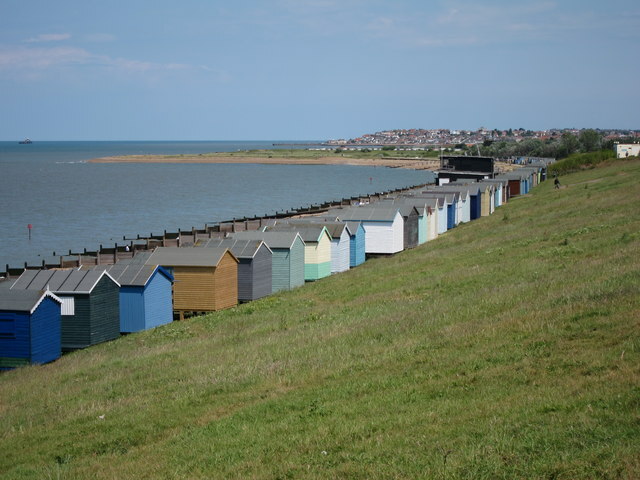 We have been out to our fav place at Tankerton and walked Louis along the grass overlooking the beach. The sea was rough and exhilarating. It blew the cobwebs away. We have been going to the park so this made a change today seeing the wind farm and the sea. So it’s a case of Pick myself up and start all over again. There are many Warriors fighting the battle and I’m still around to talk to them and be there for them. We have a new date: 30 SEPTEMBER & 1 OCTOBER 2016, again at the wonderful NH Grand Hotel Krasnapolsky! Presiding over the day will be Hans van der Wart, who did a marvelous job of it last year. It is astonishing how many aspects there are to the main topic: Asbestos & Real Estate. Many of them will be highlighted, explored and compared. I have been invited to talk in Amsterdam which is exciting. Announcing a new speaker: the lovely Mavis Nye and possibly her husband Ray as well! Mavis Nye is a Meso Warrior and long-time survivor of mesothelioma herself. Mavis will share her story and her wonderfully inspiring medical news with the Forum. The European Asbestos Forum 30 SEPTEMBER & 1 OCTOBER 2016, again at the wonderful NH Grand Hotel Krasnapolsky! For 2016, the main topic of the EAF conference will be: Asbestos & Buildings. So that is something to plan for and we will be going by Eurostar which is a new for us as we have only ever used the Euro Tunnel Train. Roll on and Roll off so you only use it through the tunnel, this time it will be a 5 hour journey. A new kind of drug for the deadliest form of skin cancer helped some patients survive for at least three years, a study shows. It’s a remarkable advance for patients who until recently faced dismal chances of living for more than a few months. About 40 percent of melanoma patients in the study were still alive three years later. The drug, which targets the immune system, was used to treat former President Jimmy Carter, who was diagnosed with melanoma that had spread to his brain. The drug, Keytruda, is among a new class of genetically engineered antibody-based medicines. They block proteins that prevent the body’s disease-fighting immune system from attacking cancer cells. This immunotherapy approach is transforming treatment for several kinds of cancer with drugs that are often less toxic than chemotherapy. The latest findings for Merck’s Keytruda (kee-TROO’-duh) are among the best long-term data ever for treating melanoma that has spread to other organs, Robert and other cancer experts said. Keytruda, also known as pembrolizumab (pem-bro-LIZ’-uh-mab,) is one of the treatments Carter received after his diagnosis last year, and he has done well. Carter, 91, was seen beaming last weekend as he helped give an honorary humanities degree to rocker Gregg Allman at Georgia’s Mercer University, where Carter is a trustee. In addition to the 40 percent survival rate at three years, Robert said 85 patients remain cancer-free. “Of course it’s not enough,” but it raises hope for an eventual cure for the disease, she said. “Looking to the future, these treatments are going to be used earlier in the course of this disease,” sometimes combined with other immunotherapy drugs, Lichtenfeld said. The Keytruda study was released at a news briefing organized by the American Society of Clinical Oncology in advance of the group’s annual meeting next month in Chicago. The American Cancer Society estimates that almost 77,000 people will be diagnosed with melanoma this year and that 10,000 will die from the disease. It’s much less common than other skin cancers and much more aggressive and likely to spread to other organs. The earliest sign is often a large misshapen or unusually colored mole that grows in size. He said success with Keytruda echoes what he’s seen in melanoma patients at his center. They receive IV infusions of the drug for an hour every few weeks for an indefinite time unless they develop severe side effects, which he said are rare. Rashes and internal inflammation are the most common side effects and they are reversible if the drug is stopped. The yearly cost is more than $100,000, a higher price than some conventional cancer drugs. Some insurers pay for the treatment, which Gajewski called “a game-changer” for melanoma, allowing many patients to return to work and live productive lives. A list of the trials for 2016 is at this link and funny enough the list covers Australia. We havent got a petition running in UK as we are governed by so many ;laws and we just would not get pass NICE Or best hope is for fast Track and The Promised Saatchi Bill. Lou Williams has a petition for keytruda onto the PSB List although Keytruda hasnt gone through all trials there it has been liscenced and on is on the PSB list for Melonoma. Lou says Trevor Grant and myself have on behalf of mesothelioma warriors in Australia sent a letter to the CEO of MSD/Merck who manufacture Keytruda in response to the letter that I received above from Hon Sussan Ley. Please continue to sign my petition to get Keytruda (and other immunotherapy drugs) fast tracked on to the PBS for Mesothelioma and 30 other rare cancers. I believe that once are successful in getting Keytruda on to the PBS for all to access as another treatment in Mesothelioma then it will follow for other cancers. It is getting closer and with a bit more pushing we will succeed. This cancer is deadly, lethal, aggressive and we simply do not have time to waste! In unity we can do this! Rod Smith Of Bernie Banton has a completely different Petition running to get Australia to Trial More Drugs as for some reason they do not get included into to many trials. We need your support! The Bernie Banton Foundation is lobbying the Australian Government, via the Health Minister, the Hon. Sussan Ley, to fund trials of drugs with the potential to treat rare diseases, and to reform the Pharmaceutical Benefits Scheme (PBS) application requirements that currently make it impractical for pharmaceutical companies to apply to have valid drugs listed on the PBS. In Australia, drug trials for treating many rare diseases are almost non-existent, as drug companies find it is not financially viable to conduct trials, due to the relative small number of sufferers compared to more common diseases, such as melanoma. Not only are trials an important part of helping find cures, and are necessary to obtain data to build a case to justify a drug being listed on the PBS, importantly, they also give sufferers hope – where often none exists! Drugs not listed on the PBS for treating asbestos cancer and other rare diseases are prohibitively priced, this often preventsdesperate sufferers with no other treatment options from accessing them! A good example of the unfairness of the system is where a drug; that has demonstrated benefits, in extending and giving better quality of life, to some sufferers of the rare terminal asbestos cancer, mesothelioma; has been listed on the PBS for treating melanoma – which we think is fabulous! This means melanoma sufferers pay only up to $38 per treatment, whilstmesothelioma and other rare cancer sufferers are paying between $5,000 and $10,000 per treatment – for the same drug! The current PBS application requirements disadvantage sufferers of rare diseases – it must be overhauled! Industry based discussion papers have made a convincing case on how the PBS application requirements could be changed to allow valid drug applications to be fast tracked onto the PBS, without losing the integrity of the system. All that is needed is for the government to see the need for change and the will to do so! The whole problem is that its the first drug we have had for Mesothelioma. Its always been palliative care only and we have now got a glimmer of hope at last and we want and need it now. The USA have had trials for some time and with a 22% response. We need more trials. Verestem have come onto the scene as well and are working with Merck. So many are working hard to make it happen. BOSTON–(BUSINESS WIRE)–May 9, 2016– Verastem, Inc. (NASDAQ:VSTM), focused on discovering and developing drugs to treat cancer, today reported financial results for the first quarter ended March 31, 2016, and also provided an overview of certain corporate developments. Clinical Collaboration with Pfizer and Merck KGaA to Evaluate Combination of VS-6063 and Avelumab in Ovarian Cancer – In March 2016, the companies announced a clinical trial collaboration agreement to evaluate the combination of Verastem’s focal adhesion kinase (FAK) inhibitor VS-6063 and Pfizer and Merck KGaA’s anti-PD-L1 immunotherapy avelumab. Verastem has previously reported initial signs of clinical activity in patients with ovarian cancer when VS-6063 is used in combination with paclitaxel. Under the terms of the agreement, the parties will conduct a planned Phase 1/1b clinical trial evaluating escalating doses of the combination of VS-6063 and avelumab as a potential treatment option for patients with advanced ovarian cancer. Washington University in St. Louis Initiated a Clinical Study of VS-6063 in Combination with Merck & Co.’s Pembrolizumab and Gemcitabine in Pancreatic Cancer – In January 2016, Verastem announced the initiation of a Phase 1 dose-escalation study at Washington University to evaluate its FAK inhibitor VS-6063 in combination with Merck & Co.’s anti-PD-1 immunotherapy pembrolizumab and gemcitabine in patients with pancreatic cancer. The trial builds upon preclinical research conducted by Dr. David Denardo, presented at several conferences in late 2015 and early 2016, demonstrating the ability of FAK inhibition to increase the efficacy of checkpoint inhibition in the reduction of tumor volume and overall survival in models of pancreatic cancer. This Phase 1 clinical trial is currently enrolling and is anticipated to enroll approximately 50 patients with advanced pancreatic cancer. Presented Scientific Data Supporting FAK Inhibition in Combination with Immunotherapy at Key Medical Meetings – During the first quarter of 2016, Verastem presented data in support of its new development programs focused on advancing its FAK inhibitors in combination with immune-oncology agents and other current and emerging standard of care cancer treatments. Data were presented at several medical and scientific meetings, including the 2016 American Academy of Cancer Research (AACR), the Society for Gynecologic Oncology’s 2016 Annual Meeting on Women’s Cancer, the Keystone Symposium on Cancer Pathology, the Keystone Symposium on Stem Cells and Cancer, and Immunotherapy World 2016. Presented Clinical Data from the Window of Opportunity Study at iMig 2016 – In May 2016, the Company announced results from the ongoing open-label, single-center, neoadjuvant Window of Opportunity study evaluating tolerability, along with biomarker and tumor volume response to VS-6063 (400mg BID) following either 12 days (Cohort 1) or 35 days (Cohort 2) of treatment in surgically-eligible patients with malignant pleural mesothelioma. Data analysis from Cohort 1 and Cohort 2 showed that VS-6063 was generally well tolerated with early signs of tumor reduction observed, with six of the twenty patients demonstrating an encouraging tumor reduction after brief treatment with VS-6063. Development of VS-4718 Continues in Solid Tumors – Dosing continues in a Phase 1 dose escalation trial evaluating single-agent VS-4718 and a Phase 1 clinical trial evaluating VS-4718 in combination with gemcitabine and Abraxane® is currently ongoing. Following results from the dose escalation trial, an expansion cohort of VS-4718 + Gemcitabine/Abraxane® vs Gemcitabine/Abraxane® alone in patients with pancreatic cancer is planned. Confirmatory Recommended Phase 2 Dose and Expansion Cohorts – The maximum tolerated dose of single-agent VS-5584 has been reached in a Phase 1 study, and the recommended Phase 2 dose (RP2D) is being confirmed. Reductions in pharmacodynamic markers of PI3K and mTOR activity and clinical activity has been observed in some tumor types. Following our conference in Houston on May 20, the 2016 International Symposium on Malignant Mesothelioma will continue with one-day conferences in San Francisco on September 16 and Chicago on October 7. Each conference will be a one-day event starting at 8:30am and ending around 6:30pm, including breakfast, lunch, and a cocktail hour, plus coffee breaks throughout the day. Each will feature top mesothelioma experts, professionally-moderated support sessions, and numerous opportunities for socialization. The first conference as part of the 2016 International Symposium on Malignant Mesothelioma will take place in Houston on May 20. 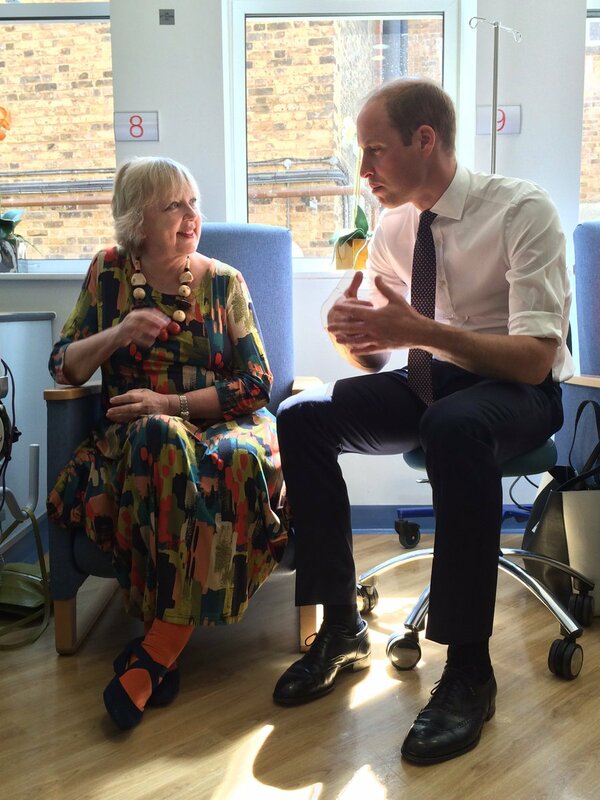 A Diary Of A Mesowarrior Living With #Mesothelioma -No 51 of Keytruda Trial,The Duke of Cambridge was at the London Royal Marsden so we missed him. I was running round the house like a mad woman getting a shower and dressing. Off up the Motorways to the Marsden and a good run.So we got there early only to be told I will be in a bed as they had so many patients. Oh no it means Im stuck in a small ward of 6 beds and somehow having the drug on a bed makes me feel a patient. Then in came my Spanish Nurse and she cant find my veins for blood. We found one but she darted right through it and was devastated as she hates seeing bruises. So it was down to Rex who is the master of finding veins. He cheated though and used my one large vein that we leave for the drug. Ray presented them with the clock we had bought to say thank you. A box of sweets didn’t seem enough. How can you thank these wonderful people that have saved your life. So they needed a new clock and they were so pleased with the one we bought. They gave me a card signed by everyone. It eases the fact next time is the last time I will see these lovely people. I have made a promise to pop in every 2 months for a chat and a tea. Then our lovely Carol came in all bubbly. She had a heart attack in December and had a stent fitted. It didn’t cure the whole problem so she had a heart bypass 7 weeks ago and is now bored at home. I was thrilled to have seen her and to be able to say bye to her. We had a long chat and then my dinner turned up. Poor Ray had to go to the canteen.He is allowed cups of tea but the dinner is for 1. When he came back the ward was quiet again and all my visitors were gone. the Doctor came and said that My kidney is playing up right at the end but its better today then two weeks ago. Its over 100 today but had gone right up to 150. ??? Isn’t it funny how we sit there and dont ask all the questions. I dont know what over 100 means. 100 what. do I really need to know and start frightening myself. So I left it as she was passing the drug and that is all that matters to me. I have lost 2 kg in weight but I explained I have been gardening and all the travel I have done lately I wasn’t worried. Im happy to be lighter. My drug was made up and came onto the ward so I was soon set up with Number 51 of MK3475.28. So there it is only 1 more to do and Im free from all this. I dont know the future but neither do the Doctors for one this isn’t in their hands its in the hands of Keytruda and my Immune system. 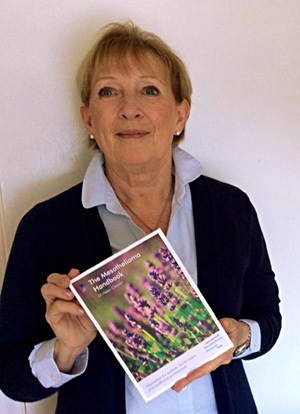 The new version of the popular JHMRF Mesothelioma Handbook is now available. Written by Dr Helen Clayson, a former GP and hospice Medical Director, who has been involved in the care of people with mesothelioma for over 30 years. Dr Clayson continues to work on research and education concerning asbestos-related diseases – including a training programme in Japan and an asbestosis project in India. She is a co-applicant on a National Institute of Health Research proposal to study the organisation and economics of care for mesothelioma in the UK. The handbook is based on her personal experience and research. Hard copies of the handbook can be obtained from The June Hancock Mesothelioma Research Fund by emailing a request tohandbook@junehancockfund.org. Please remember to include your name, address and postcode. Alternatively a flipbook edition of the handbook can be read via ourMesothelioma Handbook page. Ralph Lauren has revealed his friendship with Princess Diana prompted him to open a breast cancer research centre in London. 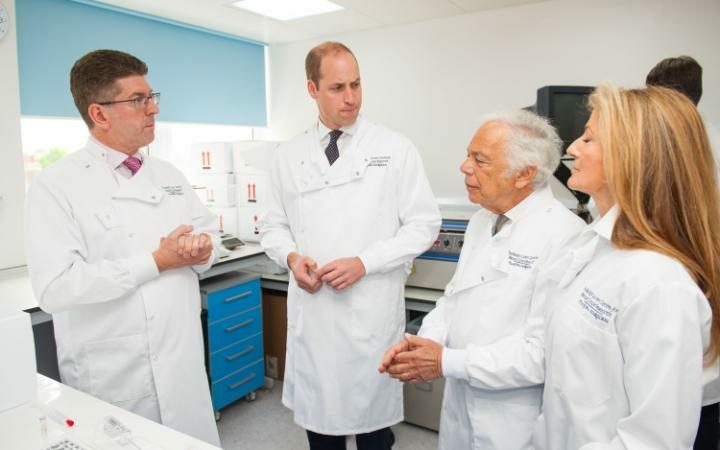 The American designer first met the Princess in 1995 when she was already the president of The Royal Marsden Hospital – said to be one of her favourite charities. And today he spoke of the “honour” he felt at continuing the life-saving work of the hospital with her son, the Duke of Cambridge. 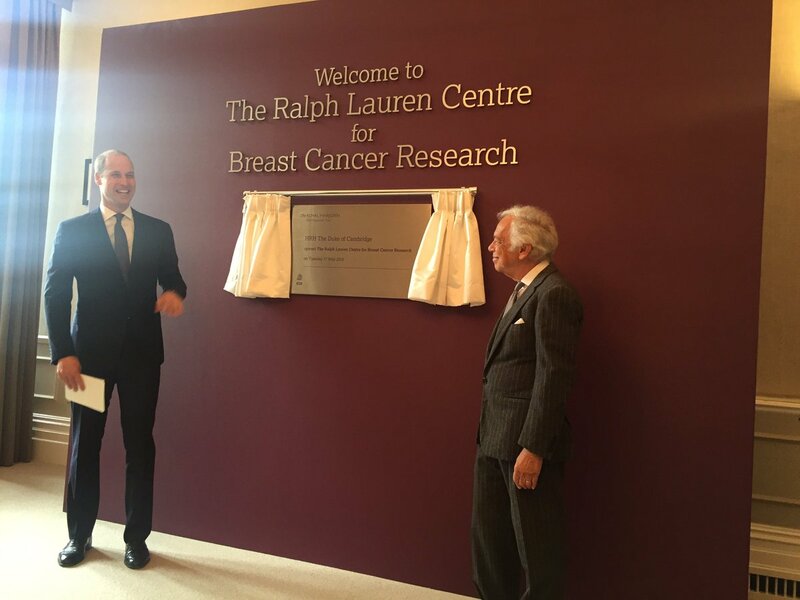 After formally opening the new Ralph Lauren Centre for Breast Cancer Research at The Royal Marsden in Chelsea, the two men were given a guided tour of the new facilities. The centre has been named after the American businessman and philanthropist who has made an undisclosed donation to the £3.9million facility. 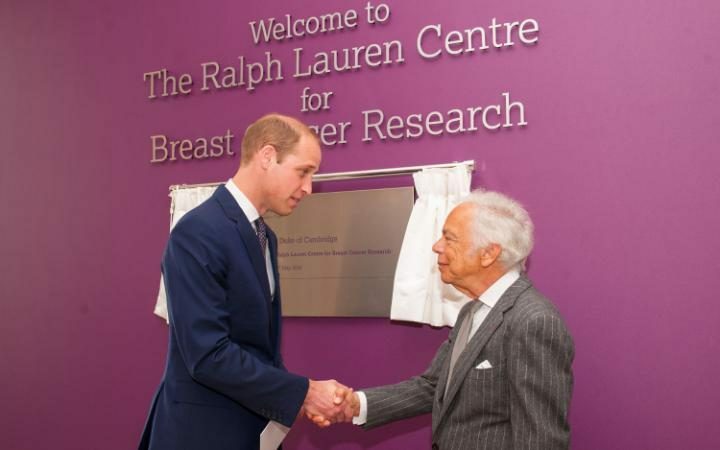 Ralph Lauren told The Telegraph: “Having known Princess Diana and how much she cared about the important research pioneered by The Royal Marsden, I am uniquely honoured to partner with her son HRH The Duke of Cambridge and see that work carried on and supported with his great dedication and the opening of our Ralph Lauren Centre for Breast Cancer Research. Speaking about his support of breast cancer institutions, Mr Lauren said: “A good friend of mine in America had breast cancer, and she said ‘Ralph, you deal with so many women, it would be a wonderful thing if you helped’. She said, ‘I haven’t gotten any support from anyone’ and I said ‘I’m going to help you’. “She didn’t make it, but I got hooked into feeling really strongly about breast cancer. During the visit the Duke, who has been president of the hospital since 2007, met patients taking part in new trials to combat the disease. He told one patient he met that friends of his had suffered with cancer. And in a lighter moment, he told another woman receiving treatment about how he was starting to look at schools for his children. 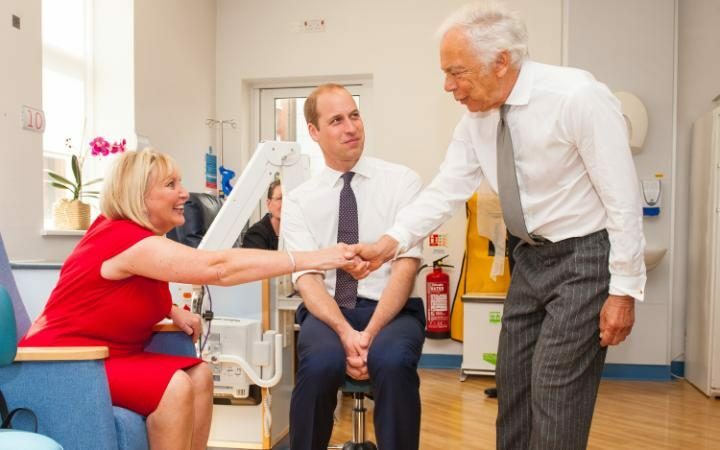 Speaking after the unveiling of a plaque to signal the opening of the centre, William said: “Seeing the courage and spirit of the patients I met today, it would be hard not to feel positive about the work being done here, and the real difference it makes. Breast cancer is the most common cancer in the UK and accounts for 31 per cent of all new cases of cancer in women. Globally it is the most common cancer in women, with an estimated 1.4 million women diagnosed every year and 460,000 deaths. The new research centre will begin a pilot study at the end of the year which could – if it proves successful – lead to a blood test being used to detect if any cancer remains in a woman’s body once she has been given the all clear. Another project is trialling the use of a new drug, which puts the tumour into “suspended animation”, in combination with a standard drug which lowers oestrogen levels – a hormone known to benefit tumours – in post-menopausal women. The Royal Family has had a long connection with the hospital, beginning in 1910 when the hospital was granted its Royal Charter of Incorporation by King George V.
Today we say thank you to the family’s that go through so much when their loved ones get that diagnosis of Mesothelioma. Their lives go on hold as they become a carer to a very sick person who is in so much pain and discomfort. They watch as they go through the talc op and the radiation and then Chemo and all the horror that brings. Their loved one laying in bed sick for days at a time. This story began in May 2009 when Mavis was rushed into Hospital. A Month Later In June at Kent and Canterbury Mavis original prognosis for this disease was 3 Months. Just get on with your life we were told. All 3 months of it. I can now leap forward a few years because you are all aware what the standard regime for meso is. Now Kent and Canterbury told us there is no more treatment available. OK go home and get on with your lives. But By this time Mavis was not in a good place, .And in no fit state to enjoy many things. She was Unable to walk more than a few paces without breathing problems she was constantly falling over. And was reduced to the use of a walking frame. She was on her last legs. It broke my heart to see her reduced to this. But mentally she was sound and she just refused to give up. She was running her Global mesowariors suport groups on Facebook. A daily blog with over 350.000 views Her web page onestop mesothelioama. She was a NHS patient rep attends many NHS meetings. Is on the end of the phone for anyone looking for help and support. Speaks in the House of Commons On speaking terms with Lords and Politicians. All of which respect her. During one of her many conferences she was talking to Professor Dean Fennel. Who had become a great friend. This was a major turning point in this long nightmare. He advised her to go to the Royal Marsden. There were just 3 places on a trial for mesothelioma on the Keytruda Trial. She was lucky to be offered the last place. 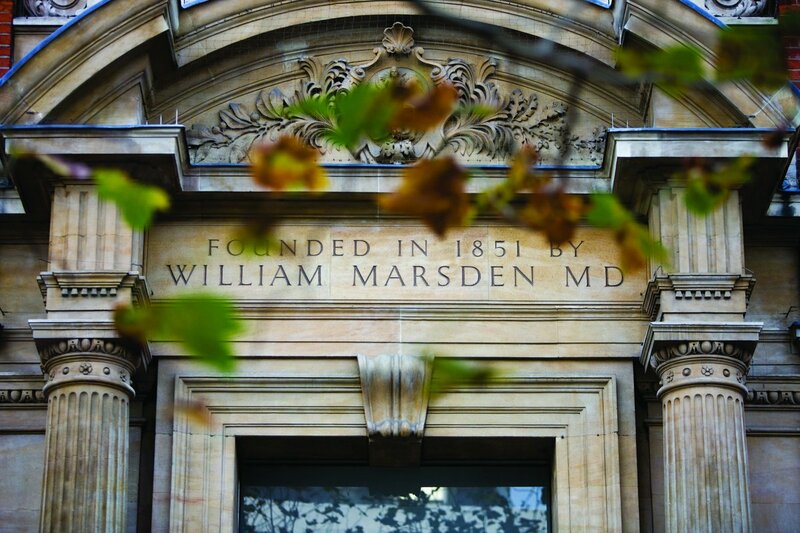 The Trial at Royal Marsden has been a fortnightly visit for 50 infusions. Getting up at 4.30 am I then have to quickly walk the dog up the lane in the dark cold mornings before setting off for the 2 hour fight on the M25. Spending all day there and the fight back home in rush hour It’s usually been a 12-hour day. It has been hard for both of us. But if this means I can keep hold of Mavis for another day then it is worth every second of those cold dark journeys. And I am certain our dog feels the same bless him. The Marsden has worked wonders for Mavis but sadly not for the others on her trial. We have Complete Response . I cannot put into words just what this means to me. And I am so happy to have most of my wife back. Life has many good things to offer. Happiness and Health And Love. But above all for me it has to be the Love for that Special Person that inspires Hope and trust I am lucky to have this in Mavis. That old saying Seek and ye shall find is proof that you must fight on, there is always hope..
My heartfelt thanks and gratitude goes out to ALL Those Doctors and Nurses who have been there for us. Without them my life would be so different. Mavis please keep it up Long may you continue this fight. I have always kept my children and family out of the publicity as they have suffered enough. We often forget the family and what their thoughts are as they travel the roller coaster with us. I see the tears in the eyes when I say, I have cancer, then the smiles when I say ” ITS SHRUNK. !!! Then the tears again when I say “Oh dear I have something to tell you its growing again” 5 times I did this to them. How cruel was that? so now I want them to all settle down and live their lives but I know that every time I go back for a scan every 2 months they will share my Scanexity with me. They will be at work worrying until I can phone and say all clear. This is the same story through all the Mesowarrior world so many families have gone through hell and back so many going through it now and more in the future. When will all this madness, pain stop. So a huge hug for all the families on this International Day for families. I had promised to deliver a box to my CNS and I wanted to see here as she has been on maternity leave. We went to New Dover Road P&R and didn’t know they had stopped the hospital bus so had to drive and park in the hospital car park. Luckily we found a space. The box was heavy but I carried it into the hospital and Toni came round to meet us. As we got to the canteen My Oncologist was there getting a coffee. Lots of smiles and hugs that now completes meeting all my medical team as there was so many at iMIG. I was busy telling her how I was and she said she has been receiving all the letters from the Marsden. I forgot that. My Oncologist had to go to Clinic so we had to say bye and we went and sat down. We talked about so much it was great to catch up. One thing we did talk about When is the right time to talk about the coroner She wants me to ask a question. When is the right time to tell us about the need of a coroner. It turns out that a GP doesn’t always know and there have been some cases where it was being missed. We as patient or carers have to be told to be prepared. it is in the Macmillan pack but people gloss over that. So I asked the Mesowarriors and they have really been good and told us what they thought and message me. The majority have felt like I did that we need telling when diagnosed. Young people have answered to at least wait until they have come to terms with the disease. So the answer is the CNS should still make her mind up and be guided by the age of the patient and how bad they have the disease. Mesothelioma is classed as an industrial disease. This means that, in England and Wales, all deaths from mesothelioma must be referred to the local coroner’s office. The coroner will then decide if a post-mortem examination is required and will hold an inquest. A death certificate can only be issued after the inquest. This can be a very difficult time for family and loved ones and it really helps to be clear about the process surrounding the inquest. The government has a short guide to coroner services and coroner investigations. In Northern Ireland, while deaths relating to mesothelioma must be reported to the coroner, an inquest is not mandatory. Usually, after consultation with the GP and family of the person who has died, no further action will be taken. In Scotland, mesothelioma deaths must be referred to the procurator fiscal. The doctor who reports the death will use a simple form, known as a pro forma, to record details about the health and circumstances of the person who has died. The procurator fiscal will then decide whether a post-mortem is required. If compensation has already been obtained, a post-mortem will not be required. It is unlikely that your family will need to be interviewed for further information. Clydeside Action on Asbestos has more information. Once it has all been discussed its like writing you will once done we can relax and carry on living and enjoying life. Ray took photos on his camera but it didn’t work which made us laugh. We walked around to the Chemotherapy room but I didn’t know any of the staff as they were all new. Things change and I was nervous back in that room as all the memories came flooding back. So we said good bye and hugged Toni and will see her at meetings as I’m a Patent Rep. We walked past Invicta Ward where I was in 7 years ago exactly I had had my 7 litres of fluid drained and was awaiting for the cells to grow in a culture. My whole journey started from there. The start of this blog had begun. It is a great pleasure and an honour to extend you a warm invitation to attend the 13th International Conference of the International Mesothelioma Interest Group (iMig 2016), to be held May 1 – 4, 2016 at the International Conference Centre in Birmingham, UK. Building on the success of preceding meetings in Boston in 2012 and Cape Town in 2014, the Conference will feature a highly interactive, stimulating and multidisciplinary program including workshops, plenary sessions as well as oral abstract and poster sessions. Under the theme of ‘Towards Personalized Care’ the meeting will address the entire patient pathway and look beyond the scientific topics alone. The Conference will provide the ideal forum to stimulate ideas and establish collaborations as well as to initiate intense discussions. Extended networking opportunities will foster communications between delegates. It is an exciting time for mesothelioma research and we hope to see you in Birmingham in 2016 for the iMig 2016 Conference. So we travelled to Birmingham for this wonderful Conference and had a great time. There is to much to write about so I will say it with photos. I have to say that it was the best Conference I have been to. It was so friendly and so Informative and so many people Well over 500 booked without those that came for a day.I met new and old friends and had so many hugs and returned so many hugs that I felt the whole experience was a celebration of my survival of 7 years with Mesothelioma.